Written and directed by Joel & Ethan Coen (A Serious Man), the 2013 music-filled drama Inside Llewyn Davis follows a week in the life of a young folk singer as he navigates New York City’s Greenwich Village folk scene in the pre-Dylan year of 1961. 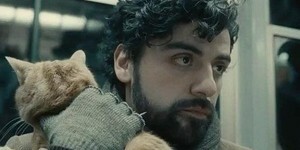 Oscar Isaac is a cool folk cat in Inside Llewyn Davis. Llewyn Davis (Oscar Isaac, Drive) is struggling to make it as a musician against seemingly insurmountable obstacles—some of them of his own making. Living at the mercy of both friends and strangers, Llewyn’s misadventures take him from the baskethouses of Greenwich Village to an empty Chicago club—on an odyssey to audition for a music mogul—and back again. Along side Oscar Isaac, the ensemble cast of the Coen Brothers’ latest film includes Justin Timberlake (Friends with Benefits) , Carey Mulligan (An Education), F. Murray Abraham (TV’s Homeland), John Goodman (Argo) and Adam Driver (TV’s Girls). The executive music producer of the film’s soundtrack is the great T-Bone Burnett, who last collaborated with the Coen Brothers on their 2000 film O Brother, Where Art Thou?. A critics’ darling that won the Grand Prize of the Jury at last year’s Cannes Film Festival, (it garnered an 8.5/10 rating at Rotten Tomatoes based on 229 reviews), Llewyn Davis was seriously snubbed by “The Academy” in terms of any substantial Oscar nominations. Nonetheless, it grossed a solid $12 million at the domestic box office in its limited theatrical release in December, 2013. Also available as an exclusive digital release on March 11 is Another Day/Another Time: Celebrating The Music of Inside Llewyn Davis, a concert inspired by the film. Featuring live performances of the film’s music, as well as songs from the early 1960s, the concert features performers Jack White, Marcus Mumford, Joan Baez, Patti Smith, the Avett Brothers, Punch Brothers, Dave Rawlings Machine, Gillian Welch, Rhiannon Giddens, Lake Street Dive, Colin Meloy, The Milk Carton Kids, and Willie Watson, as well as the star of the film Oscar Isaac.